Trennal Barn is a recently rebuilt, detached, granite cottage with plenty of character features, a large, open plan lounge / dining room, exposed staircase, wood burning stove and wide bi fold doors that open onto the enclosed garden with great views of the nearby countryside. Praa Sands, Prussia Cove and Porthleven are a short drive away. A dog friendly holiday home in a rural location. This is a beautiful stone cottage that looks like it has been part of the scenery for years but was, in fact, a derelict barn that had fallen into complete disarray until it was lovingly rebuilt by the owner. There are cleverly designed windows and Velux skylights that make it a surprisingly bright and welcoming cottage, a wide bi-fold door that opens from the lounge into the garden, a terraced area to the rear of the property and a good sized garden. Both bedrooms are spacious with a master bedroom and family room and a truly luxurious bathroom with separate shower and bath. Trennal Barn is situated just outside the quiet hamlet of Godolphins Cross and is a couple of miles inland from some of the south coasts best beaches, Praa Sands is south facing, sandy and has lifeguard cover during the season, it can have quite large waves and is frequented by surfers when the conditions are right. The main Helston - Penzance road provides good access to all modern amenities and tourist attractions from St Michaels Mount to Flambards with a wealth of pretty little bays, promontories and traditional fishing villages. 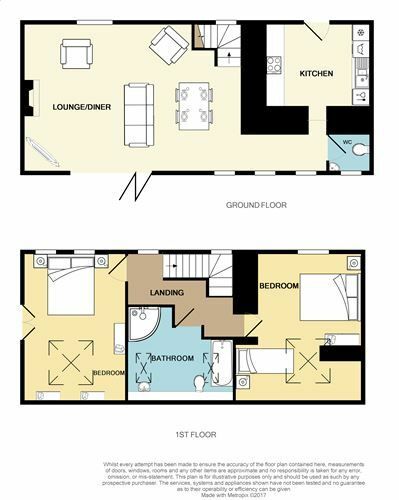 First Floor: The stairs open on to a landing area that has doors leading to the two bedrooms; Master bedroom has storage, including a clothes hanging rail, and a 5' double bed. Bedroom 2 has a 4'6" double bed & separate single bed and a clothes hanging rail. (Although not photographed, all windows in both bedrooms either have curtains or blinds). The family bathroom is beautifully appointed with a large corner shower, separate bath, WC and wash hand basin. Exterior: There is road parking on the drive for 2 cars in front of the property and a shed for storing bicycles / boards etc. To the rear is a good sized garden with picnic table, barbecue, and drying line. The garden is fenced but is not completely secure. There is an oil fired combi central heating system and a wood burning stove in the lounge. The kitchen has a range of cupboards & work tops. There is an electric oven and hob, a microwave, toaster, kettle and fridge & freezer. There is a dishwasher and a washing machine. (Drying line in the garden) The sitting room has a digital TV & DVD player. There is an iron & ironing board. There is unlimited WiFi. Electricity, heating, bed linen and towels are included but you will need to provide your own beach towels. There is parking available for 2 cars on the drive. Regrettably there is no smoking. A maximum of 2 well behaved dogs may stay in the cottage at a small additional price of £30 per dog per week. There is a cot, high chair and stair gate, all available upon request. Praa Sands in the South West of Cornwall is located between Helston and Penzance. The town contains many facilities including a shop, pub, post office and Praa Sands Gold Club. The nearest large supermarket is Morrisons towards Penzance. The extensive beach stretching from Rinsey Head to Hoe Point is extremely popular with the whole family, Prussia Cove, Perranuthnoe & Marazion are the nearest beaches, all within a few minutes drive. When the North Coast is 'blown out' you will find the surfers flock to Praa Sands for its powerful waves coming straight in from the Atlantic Ocean. Just inland from the beach is Pengersick Castle which dates back to the Bronze Age. Nearby Helston is famous for its Floral Dance in May, a day when the whole town stops and dresses up for the days many dances through the streets. From Penzance you can take the Scillonian for a day trip to the picturesque Isles of Scilly, well worth a visit if you have never been. 10 minutes down the road lies Marazion famous for St Michaels Mount, home to a medieval castle and a working local community. St Michaels Mount is accessible by causeway at low tides, or by boat. The castle is leased from the National Trust by the St Aubyn family who reside at the property maintaining and working the grounds. Trennal Barn is only 1 mile from the beautiful beach and surf at Praa Sands and about the same distance from Rinsey's rocky cove (NT). Prussia Cove film set for 'Ladies in Lavender' and Godolphin House (NT) of 'Poldark' fame, are nearby. Four miles away is the market town of Helston, full of Cornish history and tradition, with its Furry dance in early May. For children of all ages there is Flambards Theme Park next to Culdrose Air Base famous for many air sea rescue missions. There are sights to be seen around Goonhilly Earth station where the large dish Arthur is now a listed building. Try your hand at riding a 2 wheeled Segway. These together with the Seal Sanctuary at Gweek and the nearby coastal village of Porthleven provide any holidaymaker with a wealth of interesting visits. Only 7.5 miles away is the lively town of Penzance where the Scillonian offers trips to the Isles of Scilly. St Ives is only 14 miles away on the north coast with its beautiful bays and artistic areas. Trennal Barn is central for the areas and villages of the Lizard, Helford, Land's End and Mousehole. Facilities for golf, sailing, course and sea fishing are all available within two miles. You can take country and coastal walks or visit local country pubs for well-priced meals or shop in the local super stores at Helston and Penzance. There are a wealth of gardens to explore. The mines at Lelant, Geevor, Bottalack and Poldark are a short drive away. The Minack Theatre and Porthcurno beach are well worth a visit. There are world famous art galleries at St Ives and Newlyn. Guest from Ivybridge stayed for 7 nights. Second stay in 2018 . Great location and lovely cosy accommodation ideal for a winter's stay in Cornwall . Beautifully equipped with everything we needed for the week . We have stayed here twice and will probably return again. Plenty of space, well equipped and fairly central to the parts of Cornwall that we like best. It is quiet and peaceful, warm and cosy. Secure garden so pet friendly. Owners on hand if needed and always happy to help. Guest from Leighton Buzzard stayed for 7 nights. Another great week at the barn and it won't be the last, perfect setting for a peaceful and relaxing holiday yet so close to the lovely places to visit. This was our third time staying at the barn the location is perfect for getting to local attractions like st Micheal mount St Ives peas sands and so on and being able to walk to godolphin hill . The barn is so well equipped even the owner leaving cakes for your arrival they really have thought about everything. The only bad thing was having to leave on the final day . This is how holiday lets should be . Guest from Reading stayed for 7 nights. Trennal Barn is a lovely location for a holiday. It is peaceful, quiet and has a homely feel. A short walk away you get the most fabulous views out to the coast. It is an ideal base for exploring Cornwall although if you are not comfortable driving small winding roads, do not turn right out of the driveway! The Barn has everything you need for a self catering holiday and is the most stocked cottage we have stayed in. The weather was nice when we stayed so there was no need for the wood burner, but I imagine that makes the place extra cozy when it's colder. Our dog loved the garden which was secure enough for him to be let out to wander without supervision. The owners were lovely and checked to make sure we had everything we needed. I would thoroughly recommend the Barn and wouldn't hesitate to stay there again. Guest from Ellesmere Port stayed for 14 nights. We had a lovely family holiday at trennel barn.Great location lovely and peaceful everything we needed to relax and enjoy. We stayed at Trennal barn 18 months ago and enjoyed our stay so we thought we would try it again. It was just as we remembered it. We liked it so much we have already booked a return trip this year. Second time stopping here and booked for a third stay . The location is perfect for getting out and about also some great views from around the local area . The barn itself is very well equipped and comfortable and homely . Excellent cottage with everything you could need. Really good location to explore Cornwall. Relaxing week just what we needed. Guest from Banstead stayed for 3 nights. We had a wonderful stay at Trennal Barn - there is simply everything to recommend it. A great location close to some lovely dog friendly beaches and the barn itself is very cozy, well layed out and furnished very nicely indeed. It really was like a home away from home. Finally, very nice touches on arrival with a delicious chocolate cake waiting for us! We will be coming back for sure. Guest from Coalville stayed for 7 nights. We stayed at the barn in March. It was extremely warm and comfortable andvery well equipped compared to other holiday cottages we have stayed in. The garden is completely enclosed and a good size, which was exactly what we needed for our Labrador-he had plenty of room to run! There were plenty of logs and kindling for the wood burner which we lit once during our stay. The kitchen is very well equipped with several sizes of pans, roasting dishes and tins. It was lovely watching the rabbits playing in the fields behind the barn while I was brushing my teeth! There is excellent dog walking right behind the barn where you can walk for as long or as short a walk as you want and Praa Sands is a beautiful beach just a short drive away. All in all it is a lovely place to stay, very peaceful with lovely walks around. I'm think we will be returning. Guest from Upminster stayed for 7 nights. Thoroughly enjoyed our stay. The cottage was spacious, airy, tastefully decorated and very cosy. The location was excellent for getting around landsend and the Lizard peninsulars. The only concern was that the garden wasnt totally enclosed, the wire fencing at the back of the garden had been partially flattened, presumably by the horses leaning over and an inquisitive dog, interested in the field of rabbits could easily escape. Also the steep drop of the lawn/stone wall onto the paving next to the cottage was a potential danger to children and dogs that are running/playing in the garden. As a result of the above two concerns we were unable to let our dog off of the lead in the garden which would have been nice. Brilliant location for getting to lots places ....Gwithian Sands, Porthleven, Falmouth, St Ives to name but a few. A quality property , very well equipped and tastefully furnished . The log burning stove was a lovely extra and we appreciated having the bath , the dishwasher and the second downstairs toilet . We would definitely recommend to friends and would love to return . Guest from Stourbridge stayed for 7 nights. 2nd time we have stayed, a good base to travel from, nice and clean, everything you need is there for you , the cakes were very tasty, thankyou for a great week, my wife didn't want to go home!! Guest from Worthing stayed for 7 nights. Guest from Barry stayed for 5 nights. Great that they allow dogs and the Garden is contained for their safety, very good walks right outside. The Barn itself was very comfortable, very warm, with a good log-burner for winter months. Less then 2 miles to Praa Sands Beach which is outstanding, easy for Penzance, St'Ives, Helston etc. Would use again. Guest from Redditch stayed for 7 nights. lovely restored barn, has everything you need for a comfortable holiday. Lovely gardens short drive to praa sands. ideal touring place for discovering south and west cornwall. Guest from Tavistock stayed for 7 nights. Lovely Barn nestled in peaceful countryside only a short distance from all amenities and attractions. Ideally placed for walking the South West Coast Path from any direction, exploring numerous beaches, and gardens. I wouldn't hesitate to return again and would certainly recommend it to other dog owners. Had a fabulous week - Thank you. Guest from Rowlands Gill stayed for 7 nights. Guest from West Wickham stayed for 7 nights. We enjoyed our stay at Trennel Barn. It is in a quiet location, but not far from all attractions and the wonderful Praa Sands beach. It is clean, comfortable and very spacious. The wood burning fire place was lovely as the weather was a little cold during our stay. The property is well equipped with all essentials. The kitchen is also well equipped for those who cook on their holidays and the fact that Sainsburys deliver there was an added bonus. The outside space was lovely, with horses and rabbits in the field behind the property and lovely country side views all around. Shame we didn't get too sit outside and eat on the picnic bench - was just too cold!! If you get a chance and a clear night, look up at the sky - I have never seen so many stars. The barn is located along narrow lanes, which were a bit tiresome by the end of the holiday, but we got to see rabbits and bats in them. There is also a very limited mobile phone signal, so phoning to book tables at restaurants needs to be thought about when out and about where there is a signal. But if you stand on your tip toes ontop of the hill in the front garden you can sometimes get a signal. We had fun experimenting! All in all, this is a lovely property and I wouldn't hesitate to recommend it. We had a lovely week at this quiet cottage. It was very well equipped and comfortable and in a great place for reaching lots of beaches and other attractions. Our only disappointment was having to clean the cottage at the end of the week as I would have expected cleaning to be included at this price. Guest from Hailsham stayed for 7 nights. Trennal Barn is truly the most wonderful place to stay. The decor is modern and well chosen. It is very well equipped with everything you could need and very comfortable. A quiet location but close to the main road but roads are quite narrow. A small welcome pack of tea and a cake to settle in with. Emma was helpful and cheerful. Having mobility issues I would suggest a handrail on the steps to the garden as they are steep. Guest from Stoke-on-trent stayed for 7 nights. Guest from Farnham stayed for 21 nights. Great rural location but - mind your head ... ! Nice little barn conversion in a very rural location - typical narrow Cornish lanes teeming with wild flowers in May - so pretty. Situated at the foot of Godolphin Hill and several other local footpaths makes it convenient for dog walking (you can see both north & south coasts from the top of Godolphin Hill on a clear day). Pros: 1. Neat & clean - no obvious evidence of the previous occupants. 2. Lots of windows - very light & airy 3. Large comfortable bed. 4. Good sized, neat garden with large rotary clothes line. Mostly enclosed & safe for smaller dogs, but larger dogs could easily escape. 5. Surrounded by fields on 3 sides, so quite private. Cons: 1. Rubbish WiFi - even after BT Openreach came & fixed a fault, we still only got 0.5 Mb/s download (it was 0.3 Mb/s previously). 2. Upstairs in the main bedroom and bathroom, the positioning of the bed and bathroom fittings means you are in constant danger of hitting your head on the sloping ceilings. We are quite short people but still had this problem, so taller people would have a lot more trouble. I'm only 5' 3" and my head still banged on the ceiling when sitting up in bed! 3. There are no instruction manuals for any of the provided equipment (this is the first time we have encountered this problem in the many times we have stayed in Cornwall Cottages properties). This problem is exacerbated by the fact that some of the equipment has buttons where the inscriptions have been worn away (microwave buttons, TV remote etc). 4. Although there is an outside tap, there was no hose provided for washing down muddy dogs. 5. We found it difficult to find suitable places to store wet coats, boots etc - there is no obvious place provided even though there is plenty of space in the kitchen to do so. Overall we had an enjoyable 3-week break but there were certain avoidable annoyances about the property which could easily be rectified. The barn lived up to all our expectations in fact it's the best accommodations we have stayed in .in cornwall for its location The barn it's self was clean and very comfortable we enjoyed our stay so much we have booked up twice for next year . Guest from Hemel Hempstead stayed for 7 nights. We (2 adults, 2 teenagers) had a lovely week at Trennal Barn in April 2017. The barn conversion has been beautifully done, the property looks great - tastefully modern, neutral palette - and is very comfortable to come home to. The first time you follow your sat nav down the winding single track lanes you do wonder where you are going to end up, but it's well worth it! Secluded and quiet with a field of horses as your neighbours the property is actually easy to get to and the lanes become very familiar after a day or so. It's a great location for exploring the most southerly and westerly points of Cornwall, from St. Ives in one direction and Falmouth in the other, Lands End about 1/2 hour away, St. Michael's Mount/Marazion practically on your doorstep and Penzance another 5 minutes or so and offering easy access to supermarkets. The most local beach, Praa Sands is a lovely mile long sweep of sand with the well placed Sandbar ready to reward your exercise with a meal or drink or both, plus a live jazz band at Sunday Lunchtime. Guest from Manchester stayed for 7 nights. The barn is lovely, very well equipped with everything you need. The location is ideal to get away from it all and be close enough to lots of stunning beaches. Highly recommend! We all had a wonderful holiday especially Daisy our cockapoo. Super location, quiet and peaceful but only a few miles from the coast and towns. Well equipped and comfortable. Owners were very helpful. Absolutely everything we were hoping for. Guest from Atlanta stayed for 3 nights. Chosen for its location and the modern style; we were not disappointed. The cottage was ideal for the two of us and would easily have met the needs of four. Quiet, cosy and well furnished, we were particularly impressed with the welcome cake left for us as well as the basic tea making ingredients. Two big superstores at nearby Helston make it easy to stock up the fridge/freezer for your stay. With no nearby shops, I suggest you pick up a few things on your way in. Thanks Emma! Guest from Swadlincote stayed for 7 nights. Fabulous barn set in beautiful Cornish countryside yet close enough to all main attractions & the coast. The barn was very clean, well equipped, cosy & comfortable & felt like home from home. Owners very helpful & attentive. Will definitely be returning here. Spacious, cosy, quiet and dog friendly accommodation close to beautiful beaches. This is our favourite holiday rental - perfect for dog owners. A warm comfortable and very spacious living area with a well equipped kitchen makes it a pleasure to return at the end of a day walking the stunning coastal walks and beaches. Thank you! An absolute pleasure to arrive at after a long drive, beautifully clean and very comfortable. A very spacious property with a lovely garden. situated just a short drive from Praa beach and the whole of the Lizard coast at your disposal. The Falmouth serves a great meal meaning it is best to book, we had a lovely week and just wished it was longer. Guest from Portsmouth stayed for 7 nights. The Barn was lovely , really clean an excellant location for touring and very peaceful. Loved the garden. Everything is in the cottage that you would need for a relaxing week. Only thing we were not keen on was the position of the bed under the sloping roof. Guest from Fleet stayed for 4 nights. A lovely place to stay. We arrived cold and wet after a long journey. Tea things and a lovely cake greeted us. A perfect welcome. The cottage is spacious, warm and cosy. Beautiful decor. Beds very comfortable. Well equipped kitchen. Lounge perfect for relaxing in after a day out. Home from home. Hope to return soon. We had a lovely week at Trennal Barn, a great base to see all the local places of interest. The barn is very comfortable, was nice and warm, everything you needed is there for you, we hope to return in the future, thank you for a great week. Guest from Woodford Green stayed for 7 nights. Trennal Barn is a cosy property, very tastefully furnished, with lots of character. I would definately stay here again. It's very peaceful. You can also easily reach many beaches and places of interest in the area. It always felt very welcoming coming back here after a day out. Guest from Burton-on-trent stayed for 7 nights. We were a family of four and a dog that stayed for a week and I'm delighted to say that there was nothing that we could fault with our stay at Trennal Barn. It was welcoming, very comfortable, the furniture and accessories were of good quality with some real homely touches, the bedding and towels were of a similar quality, the bathroom was perfect and everything and more was available in the kitchen, any other bits and pieces you needed were in the shed. The outside space / garden was ideal, secure and well maintained. There was nothing anywhere that switched us off! The visitors book was full of positive comments and a pack of useful information about local attractions / instructions for the barn from the owners was available. The owners also left their contact details in the event of a problem. We had a fantastic week in Cornwall and Trennal Barn played a part in that, we would definatly stay there again. Guest from Tadley stayed for 7 nights. Guest from Hook stayed for 7 nights. Trennal Barn is a lovely place to stay. Extremely clean and comfortable with a lovely garden. The Barn is peaceful and relaxing but not too far from beaches, etc. We would definitely stay there again. Lovely cottage. Remote but with everything nearby. Lovely relaxing break and our dog loved the garden. Nice reduction for a last minute break as well. Would certainly recommend. Please note this image was taken prior to the barn being built! Chycarne Farm Cottages nestle on the side of Tregonning Hill, just a short drive from the stunning beach at Praa Sands. The original granite farm buildings have been imaginatively converted into comfortable self-catering accommodation providing an affordable holiday in beautiful west Cornwall. Towan at Chycarne Farm is a wonderful one bedroom cottage with country and garden views. Chycarne Farm Cottages nestle on the side of Tregonning Hill, just a short drive from the stunning beach at Praa Sands. The original granite farm buildings have been imaginatively converted into comfortable self-catering accommodation providing an affordable holiday in beautiful west Cornwall. Trenance at Chycarne Farm is a wonderful one bedroom cottage with country and garden views. Rose Lodge is an immaculately presented property, spacious and bright, tastefully furnished and well-equipped. Godolphin Cross is a secret gem of a location just inland from the golden sands and stunning beach at Praa Sands and within easy reach of the delights of Porthleven, Mounts Bay and the Lizard. Low occupancy discount based on a couple using one room. Orchard View is a delightful detached bungalow, overlooking a young orchard in a peaceful valley in the middle of west Cornwall. With great access to Mounts Bay to the south or the beaches and culture of Hayle and St Ives to the north you will be spoilt for choice in this lovely retreat. Discounts available for 1 person staying for 7 nights outside the peak season. Topped by a tower with 360 degree views over the sea and over stunning Cornish countryside, Orchard Cottage really is a dream come true for those who need a total break from town living. Orchard Cottage is attached to the owners' house and is well equipped, cosy, delightfully higgledy piggledy and well positioned for many of the main attractions in Cornwall. Book two weeks and get £75 off your second week. Smithy Cottage is a recently renovated, well equipped, semi-detached home situated on the quiet, outskirts of Marazion, a short walk from the glorious golden beaches and the causeway leading out to the world famous St Michael's Mount. Low occupancy discount based on 2 people using one room. Cliffwell House is magnificently located, yards from the sea wall, above the beach which stretches from Porthleven for 3 miles (when the tide is out) to Loe Bar. There are fantastic sea views stretching across Mounts Bay towards Mousehole and Porthcurno and you can spend hours watching the light glisten off the ever changing ocean while enjoying a bit of peace and quiet and a nice glass of wine. Low occupancy discounts available based on a couple sharing one room. The most idyllic location with uninterrupted, incredible, 180° views from the Lizard and across Mounts Bay with the beach located under your terrace. The perfect spot for honeymooners or couples seeking a romantic break with sun glistening off the azure waters, fresh sea air and wonderfully private. A stunning, modern, open plan, barn conversion, in the grounds of a Grade II listed manor house, perfect for a romantic break with 6' double bed and double spa bath. There are few better locations to explore the west of Cornwall from St Ives to Mounts Bay and the whole of the Lands End peninsula.